Outside the Baryshnikov Arts Center, where the John Cage and Merce Cunningham Studio will be housed. Nearly ten years after opening the Baryshnikov Arts Center in the southwest end of Midtown, Mikhail Baryshnikov is once again reaching out to support artists with great ideas, but no resources to make them realities. As reported recently in The New York Times, Baryshnikov is now raising money, hopefully $1 mil, to fund an annual fellowship honoring the legacies of John Cage and Merce Cunningham. 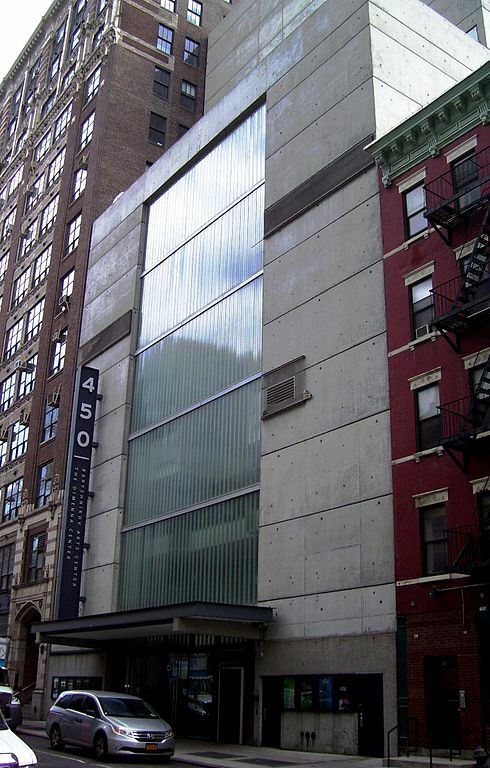 Beginning in 2015, Baryshnikov plans to award $50,000 to an artist or group of artists to enable them to make a large-scale work over a two-year period in the beautiful Studio 6A at BAC (soon to be known as the John Cage and Merce Cunningham Studio). Baryshnikov chose to name the award after Cunningham and Cage because of the lasting impact they’ve had both on himself as a dancer and on the dance community at large. Read the full article on the NY Times website here. The $50,000 prize, two-year time frame, and the promise of much-coveted studio space harkens to a growing debate among arts-funding organizations: is it better to award large sums to fewer artists with the hope that more money will enable them to fulfill every goal of their project, or partition money into smaller amounts for more artists, giving everyone a chance to make it in the dance world? Dance writer and critic recently stirred up controversy after referring to the performances given at this January’s annual APAP Conference as largely “terrible, underfunded, and half-baked.” It’s a brutal reality, but there’s no hiding the fact that when work is thrown together due to lack of funds (whether the money is used to pay dancers in order to get them to come to a rehearsal, or to secure studio space just to hold a rehearsal), the results rarely live up to what they could be, if given the proper incubation period. It’s easy to be swayed by La Rocco’s writing, and say, “Yes, let’s change our funding to only support a few standout applicants who will surely produce exciting work.” But, the dance scene (especially in New York City) now heavily favoring freelance projects rather than consistent companies, change might be a long time coming. The question of funding structures may always lack a clear right or wrong answer, or even a fair answer, but that only makes it more critical to address as funding budgets tighten on both a municipal and national level.